One of my fondest food memories growing up is weekends that seemed to last forever (ah for those days again!) and my whole family sitting around our cramped kitchen table at lunch, pulling apart my mama’s cheese scones and slathering them with butter. I recently inherited her prize recipe (passed on to her from my Aunt) and I made my first batch today. Being my mama’s recipe I was nervous to do it justice, but as the scones cooked in the oven my kitchen smelt like home. Sift flour into medium bowl, rub in margarine lightly. Add milk & mix to a soft dough. Knead gently on a floured board (if it is a bit sticky add a little more flour). Pat out to 3/4″ thickness, cut into rounds with small floured cookie cutter. Place in a greased 8″ round cake tin, sprinkle cheese over & dust with cayenne pepper. Bake in hot oven for 15mins. If cheese isn’t browned enough for your liking, finish it under the grill/broiler. 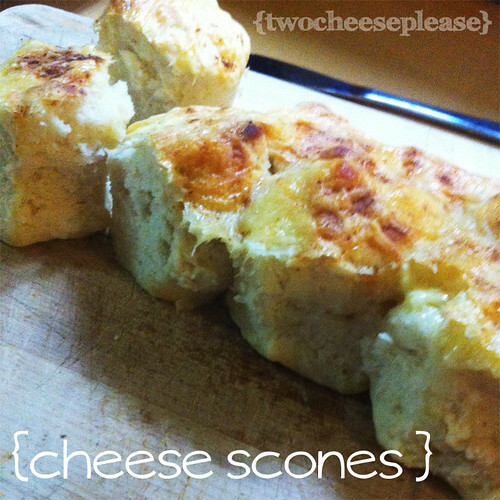 Pull apart warm scones, cut in half, butter halves & eat!